Maximal aerobic power testing (to give it, it’s full name) or ramp testing is one way to test your ‘aerobic’ fitness. It’s recently undergone a surge in popularity thanks to Trainerroad including it is as their way of testing fitness. But, what is it? How do you use it? And, what can it tell you? I’ll answer these and more in the rest of the blog. Back in the mid-1990s I found myself at the University of Brighton ready to start a degree in Sports Science. I’d started racing bikes 11 years previously, and wanted to bring science to coaching. I’d been collecting power meter files since ‘93 and started to have a good understanding of the maths and physics involved but needed to better understand exercise physiology. Almost as soon as I got to the uni, I was inundated with people wanting to test me. I loved being a lab rat :) and would regularly undertake ‘max’ tests. I noted that different people had slightly different ways of testing, and I started to think about the relationship between ‘ramp rates’ (the magnitude of increase during the ramp test) and finishing power. It was interesting stuff, and this (power data in general) seemed to connect the physiology into a nice format for me (I like numbers!). What, exactly, is a MAP test? MAP test is maximal aerobic power. However, when I coined the phrase in the 90’s my understanding of physiology wasn’t as good as it could have been! Unfortunately, it’s actually a bit of a misnomer…! A MAP test also contains a significant amount of anaerobic power contribution. But, we’re jumping ahead! The MAP test is an incremental test to exhaustion. You start at a low power (e.g. 100 W) and at specific time intervals the power you have to maintain is increased. And, increased. And, increased. Sort of ad infinitum, except at some point your body will explode and you won’t be able to keep upping the power. C) As a continuation of point B you start to get your power back up to the required intensity and continue. I’d only let this continue if the break was short (maybe 10 to 30-secs) and I certainly wouldn’t let this happen more than once! At the end of the test, I’d get you to cool down for 5 to 10-mins. Some riders may then go off and do a steady ride, and well others may just flop on the couch wishing their life was over ;-). Your MAP score is calculated by the highest average 60-sec power during the test. This isn’t always the final 60-secs (see Point B). However, if you decide to wallop out a huge 60-sec power burst say early on then that wouldn’t be your MAP either! You can then use your MAP to calculate your training zones using this calculator. Set it to MAP as you can also use 20-min power and FTP with the calculator! Sciencey bit. Why is MAP a misnomer? Maximal aerobic power states that it’s your maximal aerobic power (i.e. no anaerobic contribution!). In other words, your MAP should elicit your highest aerobic power, which would be the minimum power required to elicit your VO2max (maximal volume of oxygen uptake). 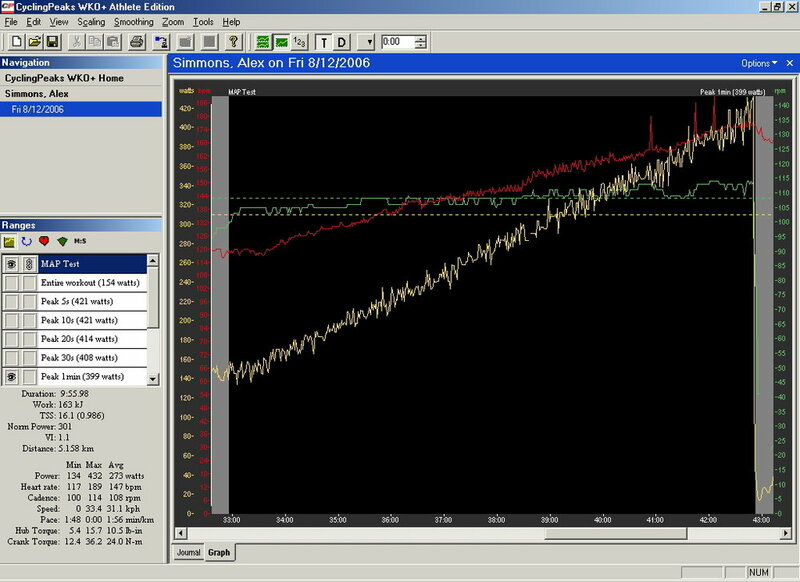 What actually happens, however, is that due to the time lag of various physiological systems and the ramp rate used your power has moved on (somewhat significantly) ahead of your VO2max (somewhat akin to how the lag in heart rate occurs when you change power output). In this instance your MAP score (e.g. 350 W) is about 10% higher than the minimum power required to hit VO2max. How do you use a MAP test? Personally, I have a ‘pre-programmed’ file I use to control my Tacx Neo. This means I don’t have to be mentally adding on the next increase in power output, or looking at a piece of paper with the next power level, while I’m blowing my brains out in test mode (because when you’re getting close to the limit, I tend to find my cognitive function is somewhat blunted, “uhhh… what’s 300 plus 25", “what was my last power I managed?…”. etc). Depending on your current fitness level, and the training you’re trying to do means you may need to test anywhere between every 4 to 10+ weeks. It really depends on your circumstance. For example I’ve just been working on increasing my FTP, and while it’s likely had some effect on my MAP, I’ve only tested my FTP in the last 3 months. (I’ll test my MAP soon!). Well, as you may have guessed (! ), it’ll tell you your MAP. So, that’s your power at VO2max, plus some anaerobic contribution. From that you can set your training zones based on MAP (that’s what we tend to do at RST Sport). If you fancy doing the test yourself you can ascertain your training zones here with the calculator (make sure you set it to MAP). Additionally, you can use it to estimate your FTP. This would usually be in the 72 to 77% range, with 20-min power usually being in the range of 75 - 81%. Thus, if you fancy it (and hey, who doesn’t!!!!!!) if you test your 20-min power on another day (not the same day!) you can see where you stack up. For e.g. suppose you test your 20-mins power and it’s 290 W, and your MAP is 360 W you know that your 20-min power is ~81% of MAP. This would tend to suggest that you’re at your current limit for 20-min efforts and it’s unlikely you’ll push it higher without first increasing MAP (e.g. you may need to do some VO2max training). Of course, it maybe that just doing steady, long, hard TT type intervals will also lift your MAP as well as your FTP - it really does depend, it’s likely to differ for different people and the same person at different times. Completing a MAP/ramp test is often easier than doing a TT type test — however, if you’re in a hard, tiring phase of training it’s likely MAP will be depressed. The great thing about the MAP test is that it doesn’t need pacing. You start easy and it gets harder and harder until you blow up. That said the last couple minutes are usually pretty grim… Have fun! RST Sport offers MAP testing at our location in Hurstpierpoint, near Brighton (UK). You can book in here for a test and consultation. If you fancy a MAP test to use with Zwift (because I love Zwift!) sign up for our newsletter, and let me know you want a copy of the test and I’ll send it to you! Please also share this blog post on Facebook, twitter, etc! Our zone calculator allows you to use 20-min or FTP as the starting point, but using our training zones. It’s ends up reverse engineering a MAP score for you. However, many of you will be familiar with Dr Andrew Coggan’s training zones based on FTP. That’s cool, Andy is a friend! Our Technical Director, Alex Simmons, created a chart and blog post showing how similar the zones are between the two systems (because both myself and Andy based the training zones on physiology). See here for Alex’s take. On the subject of Alex, back in the day, I used to coach Alex, and here’s his take when he did a MAP test! And, here’s an article I wrote (back in the last century!!) about testing and zones!